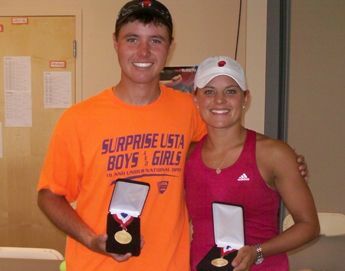 Southwest Section juniors Billy Pecor and Haley Driver made it a clean sweep of the USTA National Open singles crowns, as both picked up 18s titles at the event, which featured some of the nation's top young players competing May 22-26 at the Surprise Tennis & Racquet Complex. Pecor and Driver, both Scottsdale (Ariz.) residents and high seeds at the event, did not drop a set in any of their singles matches en route to the titles. The top-ranked boys player in the Southwest and the three seed coming into the event, Pecor put on a solid display of power tennis throughout the five days. He cruised through his first three rounds before meeting No. 2 seed (and doubles partner) Evan Song (Henderson, Nev.) in the semifinals. Pecor rolled in the semis, disposing of Song 6-3, 6-4. In the final, Pecor	took out top seed Wyatt McCoy (Shoreview, Minn.) 7-5, 7-8 (5). Pecor also reached the doubles final with Song, falling 8-6 in the pro-set to McCoy and Nick Papac (Fresno, Calif.). Carlos Bermudez of Tucson reached the doubles semifinal with Ahdiy Nathan (Rancho Santa Margarita, Calif.), and finished fifth place in singles. Driver was just as impressive as Pecor through her early rounds. After picking up a walkover in her first round, she lost just 12 total games in her next four matches, half of those in her 6-3, 6-3 semifinal win over No. 7 seed Shayne Ausin (Oak Park, Calif.). In the final, Driver ousted No. 3 seed Megan Horter (Southlake, Tx) 7-5, 6-3. Driver also reached the final in doubles with partner Sarah Toti of Las Vegas. The top-seeded	pair fell to Horter and Gabrielle Devlin (McLean, Va.) 8-4. More than 125 competitors from across the nation took part in the National Open, a level 2 national junior event.